Kiva is a crowd-funding site supporting entrepreneurs in developing countries. Through the Estrogen Army project we will be investing in women who would otherwise have a difficult time accessing traditional loans to fund their own adventures. Today we’re celebrating our fifth “Adventures with the Estrogen Army” Kiva sponsorship! Mme is an 80-year-old single mother of 7, and she’s anxious to connect to the local solar-powered micro-grid to get reliable, clean electricity at home. We’re sneaking our August loan to a Kiva entrepreneur in a little early, because we just couldn’t wait to give Mme Raphael a hand up! 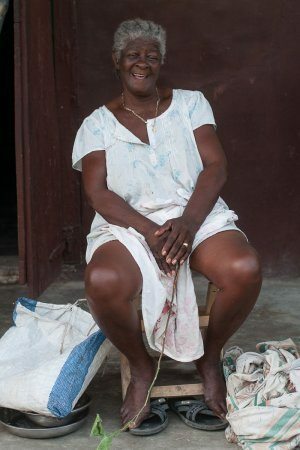 Mme is an 80-year-old single mother of 7, and she’s anxious to connect to Haiti’s first solar-powered smart electricity micro-grid to get reliable, clean electricity at home. Mme is a farmer and lives in a small yellow and brown house in Les Anglais, in southern Haiti. She worries that regular kerosene use is harming her and her family’s long-term health. Mme still needs a little help! After running pilots since 2012 that proved the benefits of prepaid quality electricity to people in Les Anglais (first with 14 households, and then with 54), EarthSpark International is developing a full-scale, solar-powered micro-grid. This micro-grid is expected to meet the needs of up to 500 households. Kiva loans allow EarthSpark to increase the number of beneficiaries by reducing the up-front costs for customers, and will be repaid over time by electricity sales. Want to help us create a little more uplift for women? When you click the link you will see “Lending Teams I Belong To” part way down, and a pull-down menu below that allowing you to set your preferred team. Thanks a bunch for giving us a hand in giving others a hand up!